Tonight I was rather humbled and extremely proud to be asked by Louise (Lou) whether I would consider writing a blog for this site from the point of view of a work colleague. I’ve known Louise for 7 or 8 years. 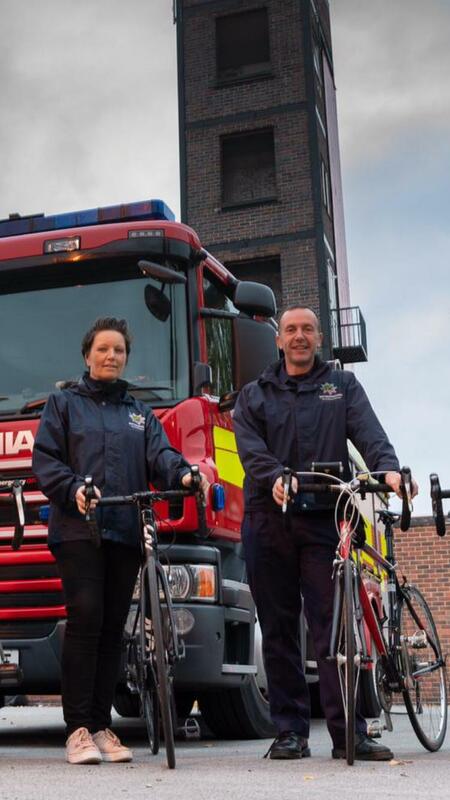 I remember when she first arrived in the office at Mansfield Fire Station following a restructure. Louise and several other Risk Reduction Officers were moved to work centrally at Mansfield Fire Station with the Education Team. A large group of people working closely together for the first time. I think it was the laugh that I noticed first, the belly laugh, endearing and totally infectious, instantly transforming the atmosphere within the room. Then quickly I noticed the passion and professionalism. Louise previously worked in the high pressure environment that is the Fire Service control room. She won an award for keeping a family alive in a house fire whilst waiting for the arrival of the Fire appliances. I couldn’t help but be in total awe of her work ethic and absolute dedication to the role. Watching Louise conduct a telephone conversation about a vulnerable person whilst typing at a hundred miles an hour on her keyboard and quickly scribbling notes on a pad is simply incredible. It usually came without warning, and it was certainly not a time to argue, as Louise, in the guise of the desk police, suddenly swooped in and cleared the lot … sheepishly I would sit there silently sulking, waiting for her to get distracted so I could safely start stacking again. “I don’t think I’ve ever had a Louise cup of tea”. I started most workday mornings with that line. It always worked. How I didn’t end up with hot tea poured in my lap I will never know. Did I mention Louise has endless patience and kindness, always thinking of others. With this as our foundation I genuinely think we clicked. Louise used to filter my frequent, mad ideas, grab the good ones, encourage and organise and praise and enable. All the time with that laugh ringing in the background. Just don’t dare put her front and centre … ever … that was not her way. The saddest funeral, and the happiest wedding followed. A house move and then another house move, and social nights out with our spouses Claire and Steve in The Whistle at Southwell and not forgetting the 4 person running club. 10K was eventually achieved but pleasure from it was definitely not !! This work colleague whom I am writing about had become to me the dearest of friends. Productive, happy years followed productive, happy years. Faces coming and going. Then one day in the office came the bombshell “I’ve found a lump, it might be cancer”. Working in the emergency services for nearly 3 decades I’ve always tried to help people. Collectively we’ve all got a “Can do” attitude. Trapped in a building, car, or in water, we will give everything to try and save a life. But with this illness the greatest frustration is that there is absolutely nothing you can physically do to help. No tool you can fetch from the locker. No wand you can wave to make it all better. The best I could offer was a hug and being there (often over a cuppa and a slice of cake at the Upton Horological society cafe) looking at poorly, sad “chemo eyes”. A year on from the first cancer diagnosis and it’s now been upgraded to stage 4. Quite honestly I’ve found this extremely difficult. I’m struggling to get this right and I know I can be better than I have been … I’m hoping that writing this blog will help. A cancer diagnosis feels like a rock thrown into a mill pond. An immediate huge splash, circular ripples spreading out, washing over more and more people. What completely took me by surprise is that you quickly notice ripples coming back at you. People who have been equally affected by this terrible disease telling their stories. People suffering in their own ways, desperately seeking opportunities to make a difference. C2C with the aptly named Tour de Friends Notts is the plan, 14 of us. Members of Nottinghamshire Police and Nottinghamshire Fire and Rescue Service including the Chief Fire Officer John Buckley. riding 140 miles over two days. And to be honest, this collective venture is a wonderful focus. Louise is our inspiration. No time to be angry, we’ve got events to organise, new people to meet, new friendships to form, money to raise. And barely noticed, but probably as impressive as the way with which she’s dealing with these momentous events, is the fact that Louise (possibly for the first time) is now steadfastly and resolutely standing front and centre. Being photographed, and filmed and writing intimately about her treatment, her good days and her bad days, highlighting the amazing people who are treating her and supporting her. Believe me, that isn’t easy for her. It takes guts, real guts. The first weeks were overwhelming and felt quite desperate. Future plans had been stolen. Emotions were raw. Treatments didn’t work. Several weeks on it feels like that phase has passed somewhat. All the pieces are now in place. Family and friends and health professionals all pulling together. Its not ideal, but it was never going to be.